This section of large indoor house plants mainly originate from the rain forests in central and south America, where they climb trees reaching for light. 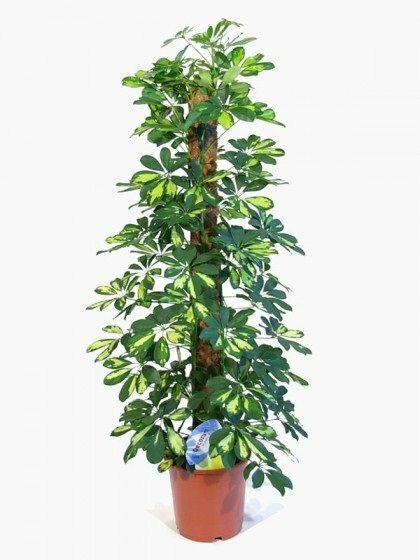 Consequently these house plants require a sturdy support as some of the house plants in this section can grow up to at least 10ft if not pruned. These plants make great house plants and are also quite straight forward to maintain. Even the novice plant keeper will achieve good results with these plants. Please note, the plant height is the overall height and includes pot. These tropical looking houseplants are actually relatively easy to look after. Moss pole plants, such as the Swiss Cheese Plant, feature lovely lush and glossy leaves. They make an attractive addition to any large room or office space. Here are our 9 top tips for taking care of your moss pole plant. Moss plants have aerial roots, which are there to support the plant growing. These roots hang from a stem and have to be pushed into the compost on a moss stick. Mist the moss on the pole regularly. This encourages the aerial roots to attach to the mesh and allows vertical growth. Moss pole plants will take average to high humidity levels well, but will start to suffer if things are very dry for prolonged periods. Repot the plant every 3 years using a peat-based potting soil. You may need to change the size of the moss support at each re-potting. Some indoor gardeners even use eyehooks or plant hooks in the ceiling as moss plants mature. Water thoroughly and let water drain from the holes in the bottom of the pot. Allow the top third of the soil to dry out between watering. Remove any standing water to avoid sodden roots. Keep slightly drier during the winter months, when the growth slows. Overwatering will make the leaves turn yellow. Under watering will cause the leaves to turn brown and fall off. Position your moss pole plant in a fairly bright room; they like light. They will tolerate low light, but if there is too little light, the new leaves will develop smaller, and farther apart on the stem. However, direct sunlight will burn the foliage, and stunt the growth of the plant. Temperatures between 18-27ºC are ideal. Lower than 18Cº will slow down growth and below 10ºC will stop growth. Since moss plants can become uncontrollable, they should be managed by pruning them back. Pruning can be done any time the plant appears too tall or whenever aerial roots become difficult to control. Cut as many stems as needed. Wash the leaves regularly to prevent the pores from becoming plugged with dust. Feeding is essential if you want new, lush green growth. Normal strength no more than once a month during periods of active growth.